In the planning stages of this trip we discussed our draft itinerary with a number of enthusiast friends, all of whom told us that a full day was probably going to be more time than we needed at Carowinds. Despite the consistency of this advice we elected to ignore it entirely as this was going to be Megan's first visit to the park and we wanted to have time for repeat rides. In the interests of maximising our day we decided to upgrade our visit with Fast Lane Plus wristbands, though it's worth calling out that we'd have managed just fine without them, as the vast majority of rides today had standby wait times of between fifteen and twenty minutes. The only significant exception was the flying coaster, which was posted at two hours but almost certainly longer due to operation speeds best measured using a sundial. My first draft of this report began with a comment about the park being one of the smaller ones in the Cedar Fair family, but when I did a fact check (yes, I do that) it turned out to be nothing of the kind; the land mass it sits on is actually the second largest in the chain, with a total area of 398 acres, making it slightly bigger than Cedar Point and almost four times the size of the diminutive California's Great America. It feels small, though, mostly because the roller coasters have been tightly packed in; the entrances to five of the thirteen can be found within the space of two hundred metres on the northern side of the park. 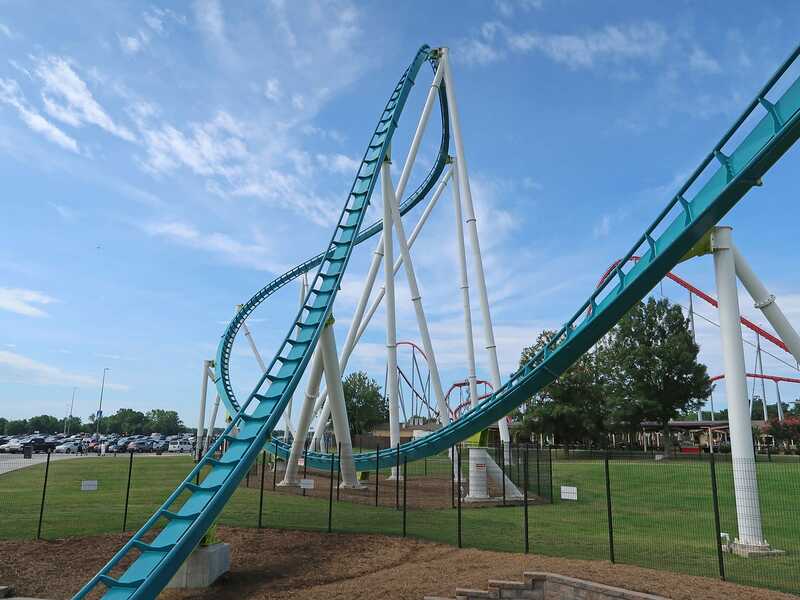 The park made a huge splash last year with the installation of Fury 325, which claimed the record for the tallest coaster in the world with a traditional lift hill, displacing Steel Dragon 2000 which had held the accolade for fifteen years. The designers came up with an exciting layout wrapped around a remodelled park entrance, clearly drawing inspiration from Leviathan at Canada's Wonderland. That ride, though very good, received quite a bit of flack for its track length, and it appears that the right people were listening; the Carowinds installation is some twenty percent longer, making it the longest steel coaster in North America and the fourth longest worldwide (after Steel Dragon 2000, Ultimate, and Fujiyama). The new coaster and its associated queuing area are covered by a strict loose article policy, and all possessions must be left in nearby lockers. There were a number of rental kiosks available in order to keep things moving, in sharp contrast to our experience at Six Flags earlier in the week, and as such the process was completed quickly. Part of me would have liked to see free storage in the ride station, but it simply could not have been done without impacting throughput, which today was running at slightly more than one train per minute. The efficiency did come at a cost, however; as with other recent Cedar Fair rides there was no preferred seating available, despite more than enough room in the station for dedicated front and back row queues. The trains look like those found on most of the other B&M hyper coasters out there, with eight four across rows featuring the familiar clamshell restraints. A quick back of an envelope calculation suggests that over half a billion riders have been safely restrained by this design over the last seventeen years, but despite that, park management has chosen to augment those on Fury 325 with seat belts that the operators make a point of pulling tight. For the most part these have no impact on the ride experience, though readers are encouraged to make sure that the buckles are flat when closing the lap bar to avoid being inadvertently skewered. The lift hill uses a single chain that is fast by comparison to most coasters, if not quite as quick as the cable system on Millennium Force. As the train approaches the apex the system slows noticeably, which serves to build anticipation of what is to come while also giving those on board time to enjoy the view. The first drop is wonderful, taking several seconds to complete, and from that point onwards the layout stays relatively close to the ground, maximising the sense of speed. There is a trim brake about two thirds of the way around that renders the following hill slightly less than furious, but that is really the only criticism that can reasonably be made of what is quite simply a magnificent ride. It's worth taking a moment to draw a comparison against the other four giga coasters around the world. Millennium Force was the first of the type, and it delivers a good ride, though it really doesn't do all that much with its speed thanks to a layout consisting mainly of sweeping wide turns. Steel Dragon 2000 scaled up the smaller Morgan coasters while somehow feeling no different to them thanks to overly protective rolling stock, and while that has been changed since the new trains suffer from unpleasant vibration that limits rerideability. Intimidator 305 is similarly limited, thanks to a layout that is arguably too intense for the masses and overhead restraints that limit the range of body types that can comfortably ride. Leviathan, though a decent ride, is simply too short. 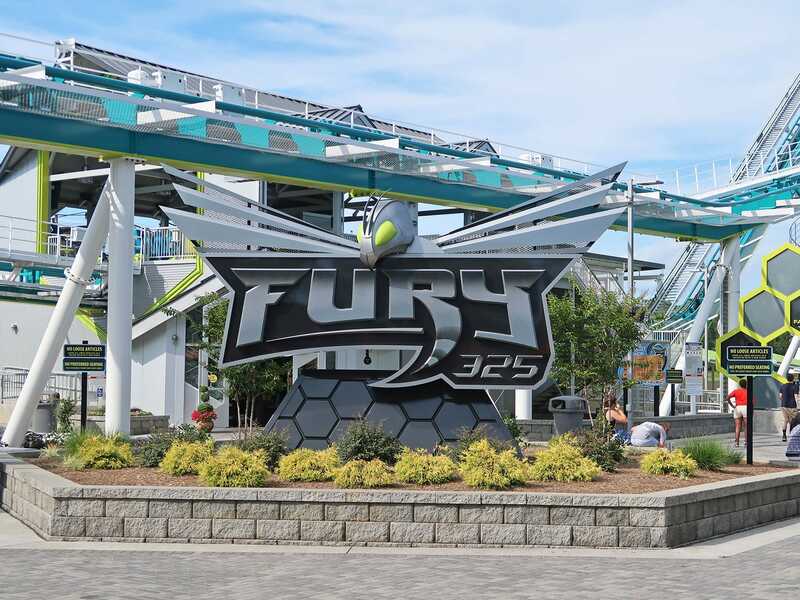 Fury 325 raises the bar, taking the sense of speed from Millennium Force and eighty percent of the intensity of Intimidator 305, and blending both with the superior B&M rolling stock to deliver a ride experience that is well up there (pun intended) with the best coasters in the world. Hard-core enthusiasts may lament the lack of extreme forces in the layout compared to something from Intamin, but one only needs to look at the number of North American installations from Intamin in the last five years (spoiler: there's only one) to realise what parks and most guests prefer. There's one other point that is worth commenting on, and that is the decision to install a second member of the B&M hyper coaster family in a park that already had one (despite the fact that the same exact thing happened in Canada a few years prior). The reality is that the two rides are completely different; Fury 325 is about speed, while Intimidator is about floating airtime. 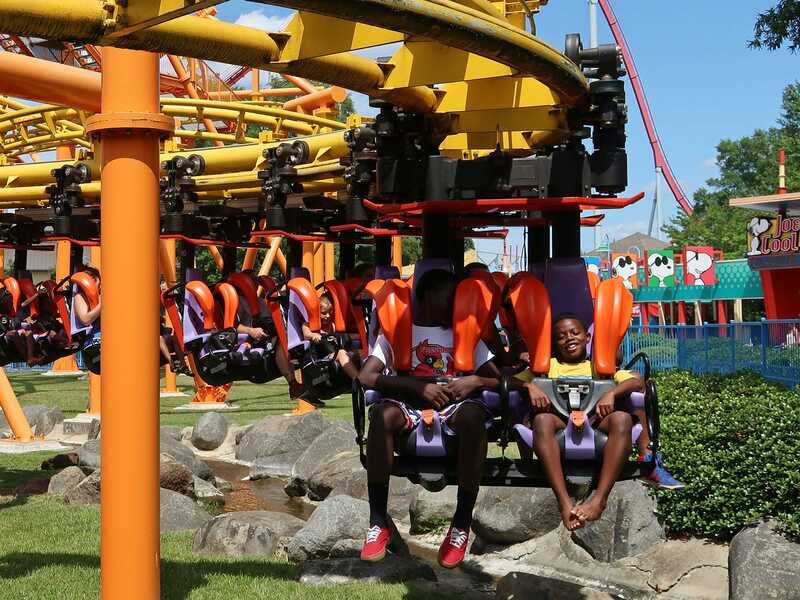 The presence of two top drawer coasters in the same location provides a competitive advantage that no other park within five hundred miles can match. There was a definite sense of moving from the sublime to the ridiculous as we decided to make our second stop at Carolina Cyclone, an ageing Arrow looper that had been repainted in a dramatic mix of purple, orange, and bright yellow. The hardware was certainly more eye-catching in bright colours than it was with the understated blue it had in times past, but to be honest it felt like management had invested in lipstick for a pig; the two vertical loops were handled reasonably well, but the double corkscrew was not smooth, and the following helix was actively rough. There was even some headbanging on a perfectly straight segment of track, an engineering achievement impressive for the wrong reasons. Our next stop was at Hurler, the ageing wood coaster that is as near as matters a clone of the wonderful Thunder Run at Kentucky Kingdom. I had high hopes for it today despite being unimpressed by it on my first visit to the park years ago, but they were quickly dashed by a trim brake at the base of the first drop that sucked away almost all of the speed. The result felt like a relaxed Sunday drive in a car with dodgy suspension rather than the exciting ride we might have hoped for, and while the tracking was smooth enough (corners not withstanding) it was far too slow to be thrilling. Later in the day we saw a train go by with just four people in it, suggesting rather strongly that park guests are voting with their feet. Ricochet is one of two coasters in the park that doesn't have a Fast Lane queue, and we decided we might as well tick it off while the queue looked reasonable. We were rewarded for our twenty minute wait by a moderately peppy ride aided considerably by the fact that only a subset of the brakes were in use. That being said, the experience felt like any other mouse in the world, a definite indication (if one were needed) that I'm beginning to be jaded by this hobby. There was a time when I found rides like this thrilling, but these days I only get really enthused when all the brakes are off, as one often finds at German fairs. (It's probably worth noting that the guests disembarking right before us seemed similarly nonplussed by what they had ridden). We were lucky enough to be given the front row for Vortex, the B&M stand-up coaster that is rapidly approaching twenty-five years of operation. Megan volunteered as tribute by taking the outside position, leaving me with what I'm given to understand was one of the few comfortable locations on the ride. In the interests of self-preservation I decided to brace for the first drop and ongoing loop, but it became apparent early on that I didn't actually need to, with the ride experience from there being both boisterous and surprisingly comfortable. That said, however, the general feedback from everyone else was overwhelmingly negative; I stood at the exit for a while, and collected a series of quality quotes, ranging from the relatively understated "that sucked" all the way up to expletive-laden rants that I'm not going to reproduce on a family friendly blog. Our overriding impression of the Carolina Goldrusher mine train was that it was a product of its time, delivering a fairly uninspired ride that was, in a word, forgettable. The first twenty-five seconds after dispatch were spent negotiating an S-shaped turnaround beside the transfer track leading to the first lift hill whose height could not have been more than fifty feet. A series of descending helices, including one through a tunnel, led to a second lift of similar stature that brought us to a long descending right turn, a hill with no airtime, a climbing turn, and the final brakes. The experience was not unpleasant by any means but it did nothing of consequence, and the lack of even token theming made the whole experience fairly pointless. We encountered a very strange operating policy on Carolina Cobra, a twenty year old Vekoma Boomerang that once operated at Geauga Lake. Today we watched bemused as the station was completely emptied for the initial dispatch of a train, with even the ride operators standing behind a safety gate next to the queue. A recording was played, stating the obvious in a clear fashion: "Riders on the platform, the train is rapidly approaching the station. Please stand back". Once the train passed through at full speed the operators began loading the air gates for the next ride, and all of them were full by the time the train made its return journey (with the recording played a second time, just to be sure). Somehow it was okay for people and operators to be standing there at that point. The ride itself had the mark two restraints, making it less offensive than it might have been, though I think I've been somewhat spoiled by the lap bar versions in Europe. We had the worst ride of the day by some margin on Nighthawk, the prototype flying coaster from Vekoma that was originally built for California's Great America. Back in 2006 I wrote about side-to-side shuffling on what was then known as BORG Assimilator, noting that it wasn't severe enough to limit rerideability. Today however that shuffling had metamorphosed into a full blown assault on riders, with the train delivering brutal full body slams and clattering around in a manner that was not fun at all. We were assigned the back row which certainly didn't help, but regardless the comfort level was equivalent to that of a SLC on a bad day, and reminiscent of some of the knock-offs encountered in China. The highlight of the experience was the three minutes (yes, really) we spent lying flat on our backs on the shaded brake run while the operators finished loading the second train. Operations were equally unhurried on Windseeker, the Mondial giant swing ride that is known to close in conditions of high wind. We timed how long it took from when the gondola parked at ground level until the next dispatch, and found it to be a somewhat embarrassing five and a half minutes, leading to a capacity of around half the manufacturer's estimate of 960 guests per hour. The operator was directing people to specific seats, which seemed a bit bizarre to me given that there was no obvious advantage in doing so, and it's worth noting that this didn't actually work at all as a significant percentage of guests ended up taking the wrong ones, thus causing minor issues everywhere. While all this was going on another staff member on the microphone tried to drum up enthusiasm from North Carolina and South Carolina in turn, before proceeding to sing the "happy and you know it" song. It feels almost churlish to point out that I'd have been happier (and I know it) if she'd just hit the wretched dispatch button. The view from the top was worth the wait, and I found myself regretting the fact that the use of cameras is strictly forbidden on board. There was no camera embargo on the Carolina Skytower, though the glass windows and lack of recent cleaning there meant that the pictures we got there, though decent enough, were not quite as good as those that we might have had from Windseeker. After two fairly sluggish rides it was almost a relief to see an efficient crew on Intimidator. Three trains were in use today with minimal stacking, though it's worth calling out that once again this was being achieved at least in part by assigning guests to rows. There was an understated call of "Gentlemen, start your engines" as the train dispatched that sounded like someone reading news headlines, rather than someone getting excited over a race, and oddly enough that set the stage for the rest of the layout, which delivered a pleasant float over every hill without being particularly forceful. The experience was as smooth as I remembered from a few years ago, and indeed the only real negative today was the appearance of the track, which had faded to a pale pink from its original blood red. At this point we had done all but one of the adult coasters, but a quick peek at Afterburn revealed it to be in an advanced state of non-functionality, with a train parked half way up the lift and a veritable swarm of engineers nearby. Rather than wait we decided we might as well tick off Woodstock Express, a clone of the child-sized wood coaster we'd ridden two days earlier. This installation was somewhat more bouncy than its brother, though the buzz-bar restraints meant that there was no real impact to rider comfort, and it's also worth complimenting the park for having two trains in use. I wasn't overly impressed by the loading speed, which today was averaging around five minutes per train, but the queue was short and it was fairly evident that guests rather than operators were causing the problem. We also took a look at Lucy's Crabbie Cabbie for the benefit of Megan, but unambiguous signage in the queue and on the station platform forbidding unaccompanied adults made it clear that this was not a credit she'd be claiming today. We made a brief stop at Boo Blasters before heading to Plants vs Zombies Garden Warfare, a new attraction added to the park this year that was marketed enthusiastically as "the world's first intra-active 3-D game experience". Neither of us had taken the time to research things in advance, so we were somewhat surprised when this "Carowinds exclusive" turned out to be nothing more than an upgraded and re-themed version of Desperados, a target shooting attraction developed by Belgium-based Alterface in 2006 and now found all over the world. The experience was entertaining enough for what it was, but it wasn't compelling enough to justify more than one ride. We went for a second look at Afterburn and found it testing but not open as yet. Sitting in the shade was quite an appealing option, but instead we found ourselves back at Intimidator, where we clocked up two more laps, both of them towards the back of the train. It was a pleasant surprise to discover no perceptible vibration, in sharp contrast to some recent B&M products, making for highly enjoyable rides. It was just after four in the afternoon when Afterburn finally opened, and as luck would have it we were close to the entrance at the time. 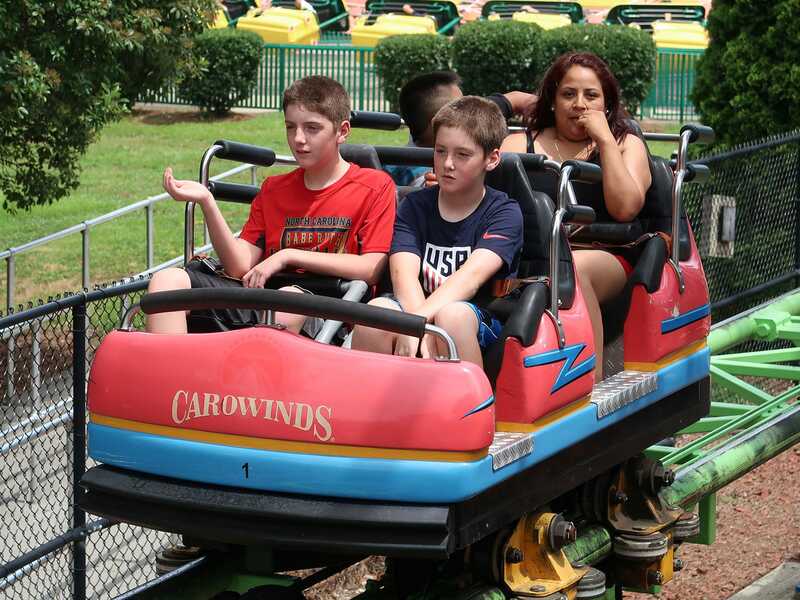 I'm sorry to have to report that there were seat assignments in use here too (if anyone from Carowinds is reading this, the hit to guest satisfaction from telling people where to sit is absolutely not worth the marginal capacity increase!) and as a result we ended up in row four for our first lap. From that location the ride quality was absolutely fine, though it's fair to say that neither of us managed to follow what was going on; it simply felt like a sequence of smooth inversions blended into each other. We went back for a second lap and managed to score a front row, and the difference in the overall experience was night and day. 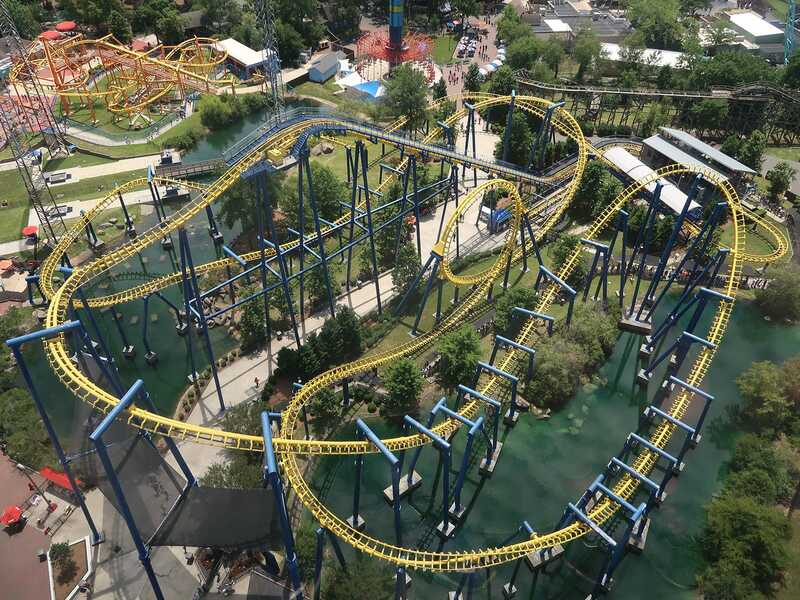 It quickly became obvious that the twisted first drop and loop were effectively cloned from the various Batman the Ride installations, but from that point onwards the course followed the terrain, bringing in five more inversions including a superb batwing element borrowed from Montu. We decided to conclude our day with a few more laps of Fury 325, and our wristbands allowed us to clock up a total of five in the hour we had for our locker rental. The coaster gods were apparently smiling on us, as despite assigned seating our last ride ended up being in the front row, a truly glorious experience that I'm unlikely to forget any time soon.